America's best-selling tri-folding cover has been redesigned with a new clamping system, strong yet light frame, and lower profile appearance. The Trifecta 2.0 remains easy to install, simple to use and has a best in class lifetime warranty. All New Design The best selling original Trifecta soft Tri-Fold cover just got better, the reinvigorated Trifecta 2.0 offers a host of new features but remains easy to install and simple to use. Easy to Install The all-new Extang Engineered clamping system attaches to your truck in seconds. Simply square up the cover to your truck and clamp the cover on. Simple to Use Open your tailgate, release the EZ-Lock Clamp and fold the cover back to your cab. 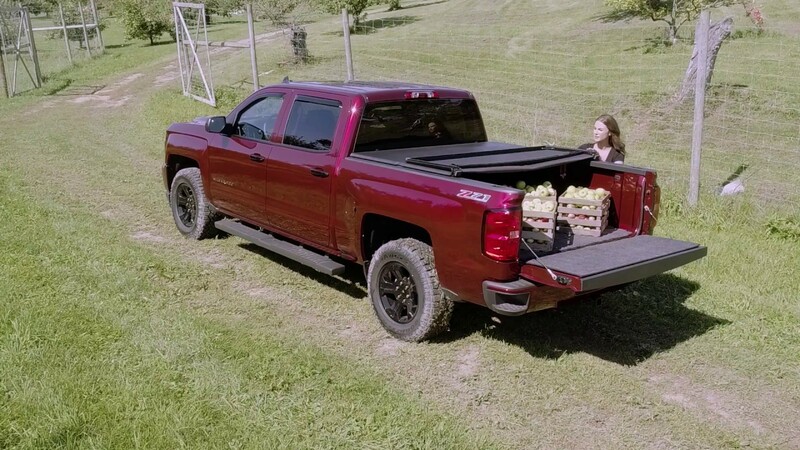 Best In Class Warranty Not only does Extang cover your truck bed, we also cover your Trifecta 2.0 for the long haul with our industry exclusive Lifetime Warranty. Strong Strongest in the industry, the frame is made of lightweight aircraft grade aluminum. The best selling soft Tri-Fold cover just got better. The ALL-NEW Trifecta 2.0 has been reinvigorated with a host of new features but remains easy to install and simple to use. Extang Trifecta 2.0 has new sleek lines and soft curves, On and off in seconds, Smarter clamping system. Available for nearly every truck including tool-box models and our unique Signature Series fabric. Designed, manufactured and assembled in the U.S.A.
WARRANTY DURATION: The Extang Extang Trifecta 2.0 Truck Bed Cover carries a lifetime warranty against defective materials or workmanship on all truck bed cover rails, aluminum components, clamps, bows, hardware and vinyl covering. WARRANTY CONDITIONS: This warranty is against defective materials or workmanship. The warranty is void if the product has been damaged by accident, unreasonable use, neglect, improper service/installation/removal, modifications, acts of God, normal wear and tear or other causes not arising out of defective materials or workmanship. Consequential and incidental damages are not covered under this warranty. THE FOLLOWING CONDITIONS WILL ALSO VOID THE WARRANTY: Wind whip damage — Tarps must be secured at all points when vehicle is in motion. An unsecured tarp will flap, resulting in damage to the fabric. Improper cleaning — It is recommended to use the tested and approved Extang Tonno Tonic or clean with soap and water only. Do not use vinyl conditioners (i.e. Armor All) because they will shrink the vinyl. Overloading of cargo — Cargo should not touch the tonneau at any point. Protrusions in the tarp will stress the fabric. Cargo may shift while traveling and cause it to push against the fabric or panels and damage it. Driving with panels open or improperly secured on all folding tonneaus — Prior to vehicle operation, clamps must be tightly secured so that clamp lips tightly grip the inner bedside metal surface. Open position: Tonneau must be completely folded and secured with BOTH buckles. Closed position: Tonneau must be completely flat and secured at all 4 clamps. Opening panels without removal of debris on all folding tonneaus — Top of tonneau MUST be free of foreign material including snow and ice before opening panels or severe damage may result. Towing — Do NOT tow your vehicle from the rear with any Extang tonneau cover on your truck.